Standing at the starting line in the early morning hours of Saturday, April 11th, all I could think was this seemed like a much better idea in January when I signed up for it. But there I was, at 7:30 AM in somewhat chilly weather with my Disney sister, Catherine, waiting for the Hershey 10K to begin. Actually, I’m getting ahead of myself in this story, let’s start with the drive to get there on Friday. 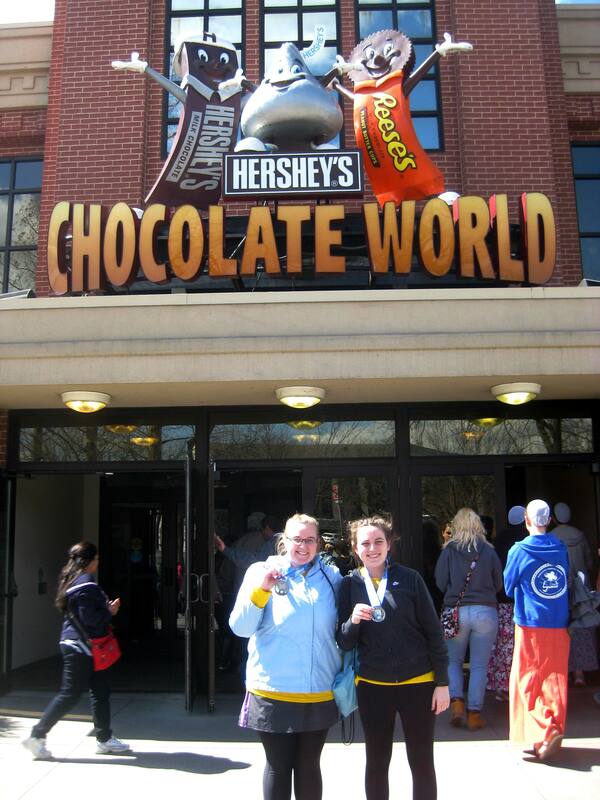 I live roughly 5 hours from Hershey Park where the race was taking place, a drive that would consist of nearly 300 miles on the Toll Road through the winding mountains, and decided to use my Easter holiday at work so I could make the trip earlier in the day. I planned to arrive around 2:30 PM, which meant I would need to leave around 9:00 AM, which meant that my family had already left for work and school when I came downstairs around 8:00 AM. but much to my surprise, my little sister had left this very sweet note for me to find taped to the kitchen cabinet. I have driven through the Pennsylvania mountains only once before when Catherine and I met up with a third Disney sister, Lisa, while she was attending Penn State a couple of years ago. From the trip, I already knew mountain driving terrified me as I live in the relatively flat mid-west. Now, to add to my anxiety about this long drive, as soon as I cross the state border I enter into a torrential downpour that does not let up until I am 10 minutes from my destination, Catherine’s boyfriend’s (Matt) parent’s house. It was raining so hard, I could hardly see five feet in front of my car while twisting and turning around these mountains and because that just wasn’t scary enough, there was this section that according to the signs is a terrible fog area. I felt like I was driving blind. I could see nothing to my left or right, nothing in front of or behind me. I have never held so tightly to the steering wheel before. At this point, I would say my stress level is a 7 but it quickly rose to a 9 when I had to drive INTO the side of the mountains. Typically I’m not a claustrophobic person, but driving in those tunnels (and there were 6 total) my heart was pounding so hard in my ears I could hardly hear anything else. Deep breathing and pep talks got me in and out safely. Reflecting back what I find interesting is that I have driven through mountain tunnels before as the passenger and I’ve never had a problem with them so I wonder why being the driver in a tunnel makes me so nervous. Just when I was beginning to think I was never going to get to Matt’s house and that I would be driving around lost in the Pennsylvania mountains forever, I heard the most beautiful words coming from my GPS “arriving at destination on right.” In that moment I could have cried I was so grateful to be done driving and to see Catherine waiting for me in the driveway! Excitedly she tells me she has a surprise! Much to my amusement and Matt’s dismay, we found ourselves at a Disney outlet store, because where else would two Disney sisters go for entertainment?! 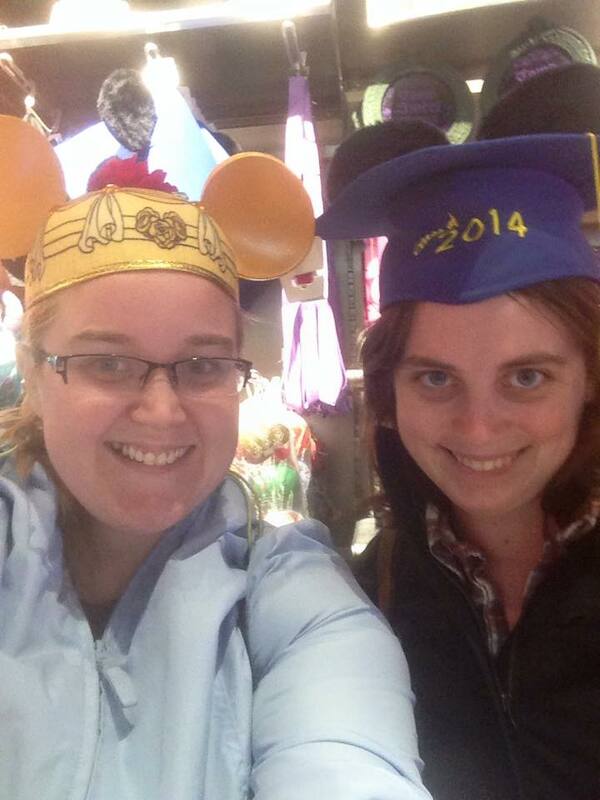 We had a blast looking at all of the Disney merchandise, and as you can probably tell, we did not leave empty-handed! 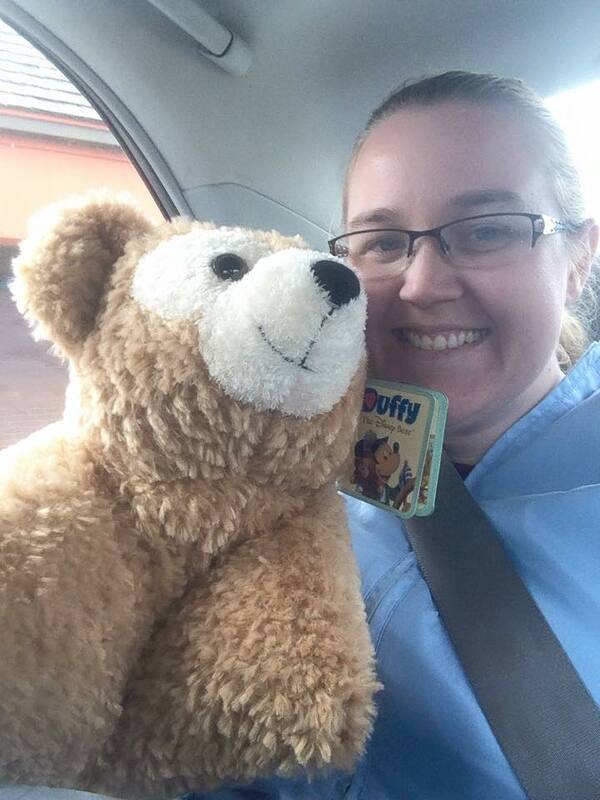 She walked away with some cute pjs while I bought an adorable Duffy pillow-pet that was 50% off – I couldn’t believe it! After the Disney store, we drove around a bit looking for the Amish farm that sold milk and cheese, then it was dinner and back to Matt’s for some much-needed shut-eye. At dinner we determined that because the race started at 7:30 AM, we wanted to be at Hershey Park around 6:30 AM since Matt and Catherine had pick-up or packets already. We allowed for 45 minutes to get there from Matt’s house, which meant leaving at 5:45 AM. To make sure we didn’t sleep through the race, I set a first alarm for 4:45 AM and Catherine set a second alarm for 5:00 AM. And when that terrible sound pierced through my dream and startled me awake, I really wasn’t excited to be a runner, all I wanted in that moment was to be a sleeper. But I pulled it together, checked the weather like the non-newbie runner that I am and decided on pants and a jacket for the morning’s race. Amazingly, Catherine and I stuck to our time schedule very well and only had a tiny bit of excitement in our journey to Hershey Park when my GPS apparently got a bit confused and started sending us in circles. But not to worry, we found our way and made it to the starting line with plenty of time to spare. And before we knew it, it was race time! All 3,000 runners packed into the starting corral. It was exciting for me to see that some of the other runners were wearing race shirts from runDisney races I had also done in the past! I felt connected to these people, like we shared a bond of not only racing, but of Disney as well. Silly what your mind thinks about at different moments. And just like that, we’re off! 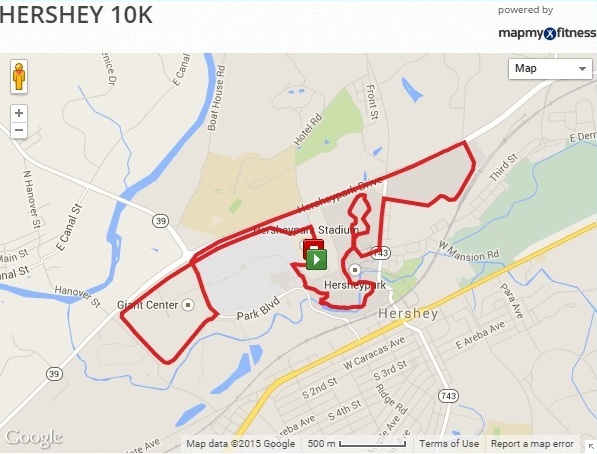 Now for those of you who may not be familiar with different race distances, a 10K is 6.2 miles – half the distance of a half marathon, which I completed in November. So with my music blaring in my ears, Catherine and 2,998 of my running buddies at my side and chilly mountain air in my lungs, I felt ready to tackle the course. 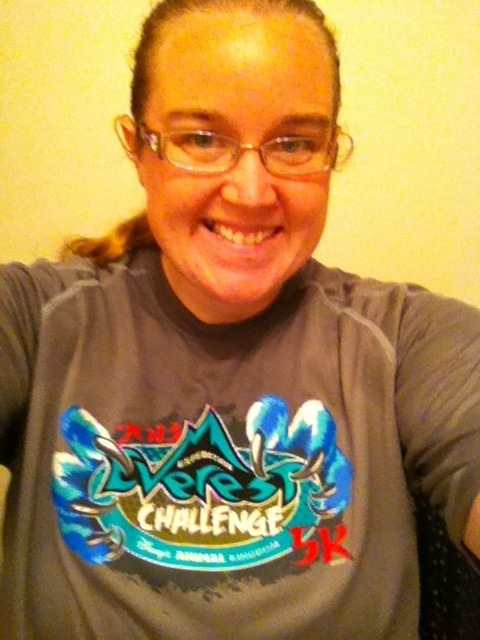 However….there was one thing I forgot to plan for in my not-so-decent training for this race (hey, we had multiple blizzards this winter, made running outside a bit challenging! ), ALL THE HILLS NEARLY DEFEATED ME! I mentioned it once, where I live is really pretty flat in the grand scheme of things, sure we have some hills, but they are NOTHING compared to running on the side of a MOUNTAIN! Catherine and I started off together, but eventually the hills and the chilly air got the better of me, and so I told her to go ahead, I’d catch up. I ran when I could and walked when I needed to, but I never once stopped moving. I knew that I needed to keep a 14 minute/mile pace or I would get detoured around the park and wouldn’t be able to run through – I wasn’t about to let that happen. About 2 miles in I settled on a rhythm – jog a little, walk a little, just keep breathing, jog a little, walk a little, just keep breathing. I had found “my people” – runners who shared my pace, runners who fought with every step to be runners, runners who didn’t “look like runners” but were, runners who kept me moving forward. By the time we came to the first of two water stations, we had already gone under an over pass, up a small hill and crested a large hill to get up onto the main road. My energy levels and my spirits were beginning to drop. but then I heard someone cheering my name, telling me specifically great job, you’re almost halfway there. At the time I couldn’t figure out how they knew who I was – I was 5 hours from home, I didn’t know these people, it wasn’t until after the race it dawned on me, my race bib had my name printed under my number! Those volunteers with the cups of Gatorade and water will never know how much they encouraged me to keep putting one foot in front of the other. Up another hill, around a corner and through a shopping plaza. I was beginning to wonder if I’d ever see mile 4. Just as I was losing hope I spotted a fellow runner who had finished cheering us on! From her Minnie Mouse ears and Sparkle skirt I wondered if she was also a fellow runDisney fan! As I went past her I heard her say one more turn and you’ll be in the park! One more turn, just one more and I would get my first glance of Hershey Park. I pushed a little harder and by golly if there wasn’t ANOTHER hill once I passed through the back park gates! Ugh! But the coasters – holy cow!! With only 2 miles left on the course I was doing good until, you guessed it…MORE FREAKING HILLS and would you believe it, the beginning of a terrible Charlie Horse! But, at least the race photographers got some great photos of me in action! So glad I bought these! With only a quarter-mile and two turns between me and the finish line, there was Minnie Mouse ears and Sparkle skirt again! How did you do that?! Didn’t I just see you about a mile and a half ago?! Once again she cheered “Mariah, two turns and you’re there! You’ve got this!” I was so tired and emotional I almost burst into tears! With pain shooting through my leg and the finish line in sight, I dug a little deeper and gave it my all as I completed my race with an official time of 1 hour 29 minutes and 34 seconds! It was great having Catherine, her boyfriend Matt and his dad there cheering me on at the end! This is what complete exhaustion and accomplishment look like! 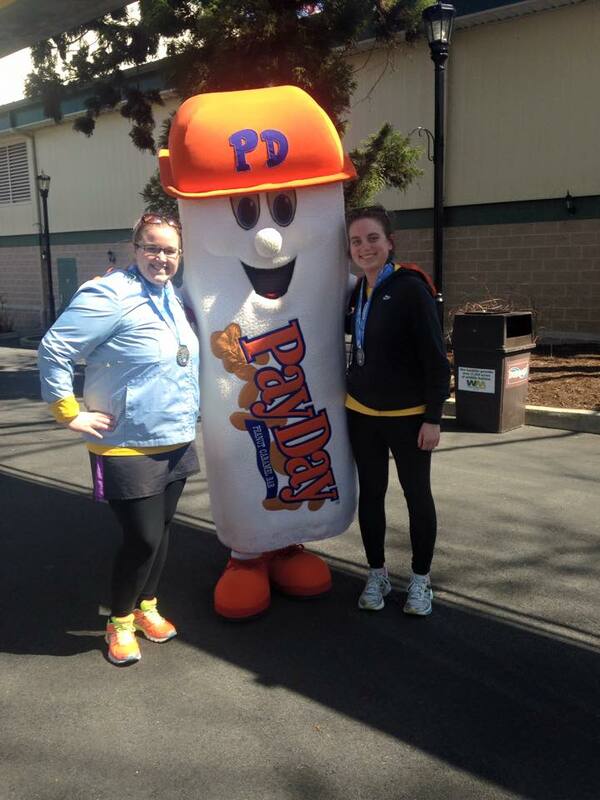 And so, yet another race is in the books – this one however I have dubbed a one and done kind of race. I’m not meant to be a mountain race kinda girl and that’s okay! Finally it was time for some much earned breakfast (Catherine and I had split an English muffin before leaving for the race, but it was long gone by now!) I had the pleasure of enjoying the most delicious sourdough french bread at this cute little diner while we waited for Hershey Park to official open for the day. Since I had a long drive home ahead of me that evening I wasn’t able to spend a lot of time exploring Hershey Park, but I did have a chance to go on the Hershey Chocolate World Factory Tour ride, Skyrush, Lightning Racer, and Wild Mouse. All day long I had been wearing my Fitbit Charge HR so it was fun for me to see what my heart rate was when we go off each ride! And before I left on my long journey home, Catherine and I took a couple of celebratory photos with our shiny new medals! On the road again by 2:45 PM, this time in beautiful, sunny weather. Still hate mountain driving and tunnels, but way less stressful when you can actually see the winding roads you’re driving on. One insensitive to get home quickly was the large chocolate chip cookie that was in the snack pack bag racers received at the finish line. When I finally got home at 7:30 and went to take a big bite, much to my disappointment I discovered it to be a RAISIN COOKIE masquerading as a delicious Hershey Chocolate Chip cookie. What a let down! But cookie mix up aside, the weekend was a blast on so many levels! I got to add racing in a new state to the list, hung out with one of my wonderful Disney sisters, explored a theme park I’ve never been to before and once again proved to myself that while running may not come as easy to me as it does to others, with a little determination, training and a supportive running community, there’s nothing that will stop me from crossing the finish line of any race I commit to! At this exact time in 30 (short) long days, I will have been in Florida for just about 5 hours! Now, if you’ve been following my blog for sometime now, you’ll know my love of all things Disney, and more recently, my love of all things runDisney and racing. And this trip is extra special, I will be participating in my very first half marathon – Wine and Dine 2014! Never in a million years would I have thought I’d be preparing to run 13.1 miles FOR FUN. Like all of my previous runDisney races, I’ll be running with my Disney sister, Monique – who got me hooked on this expensive, but thrilling, hobby…. 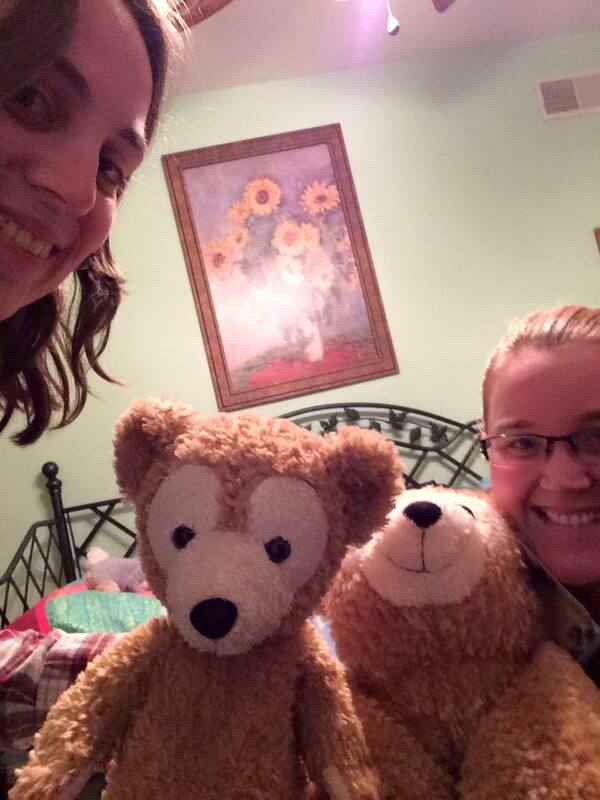 This time, we even convinced another Disney sister, Catherine, and her sister, Alison, to join us! I can’t wait for our Disney CP roomie reunion! 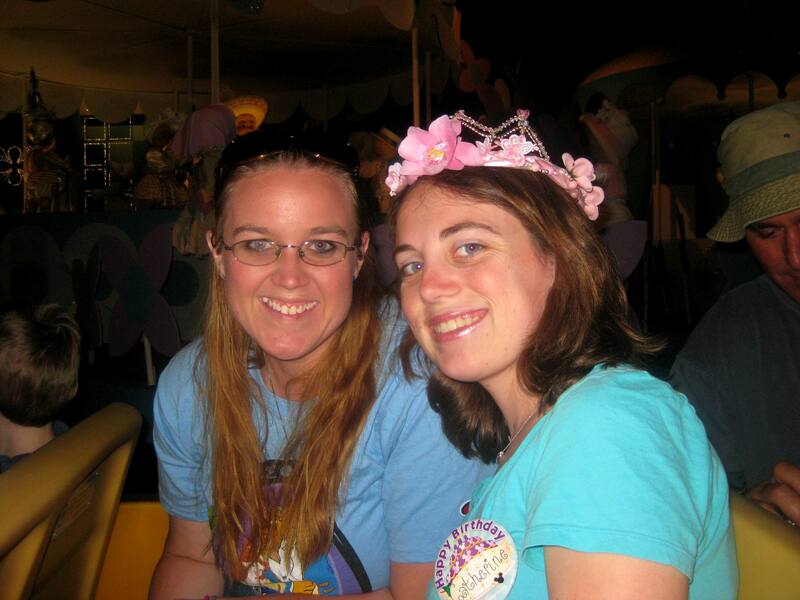 Catherine and I on “It’s a Small World” – we were celebrating her birthday! I have been training for this race since April, and some days I’ve discovered are harder than others, physically and mentally. I’ve learned a lot about myself – running it turns out helps me process life and problems and issues and just lets me clear my head. Yes, I listen to music as I’m running/walking/crawling (okay, I’m joking, but some days it feels like that’s what I’ll have to do to get back home! ), but honestly, 9 times out of 10 I don’t even know what song is playing. I’m much too busy watching for loose stones and rocks and pot holes and cars – I’m a county road runner, we don’t have sidewalks. And I’m an asthmatic, which means a good portion of my brain is focused on breathing and picturing my “happy place” – sandy white beach, soft waves at sunset, when I feel my lungs start to tighten. I’ve taught myself to visualize wide open spaces, my lungs filling with fresh air – it calms me down (when you can’t breathe, it’s VERY stressful) and helps me refocus at the task at hand – placing one foot in front of the other. When I began my training, a 5K was difficult. 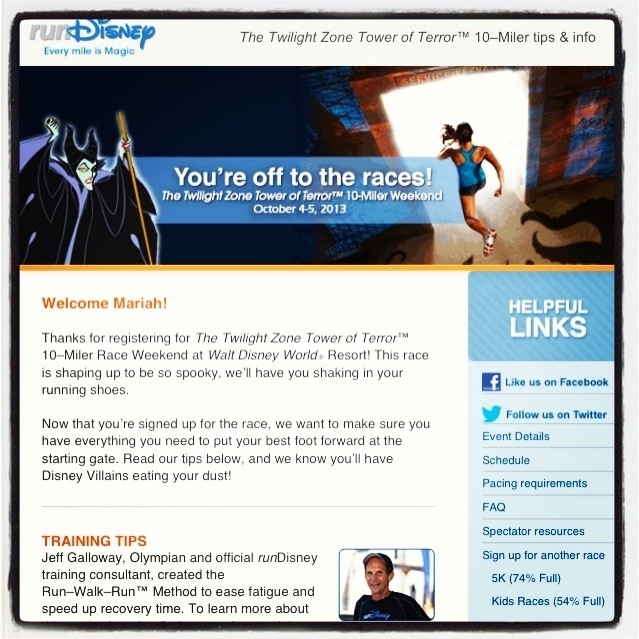 The last long distance run I had done was the 2013 Tower of Terror 10 miler in October. Now, I live in the northern part of the U.S. and winters here are harsh, especially this past one, so needless to say, I was back in terrible shape. I was frustrated. I KNEW my body was capable of running a distance of 10 miles, but I could barely go three. I told myself it didn’t matter if I was the last one to cross the finish line, or if I had to crawl across it, one way or another, I was going to prove to myself and every naysayer I’d ever met, that I could do it. 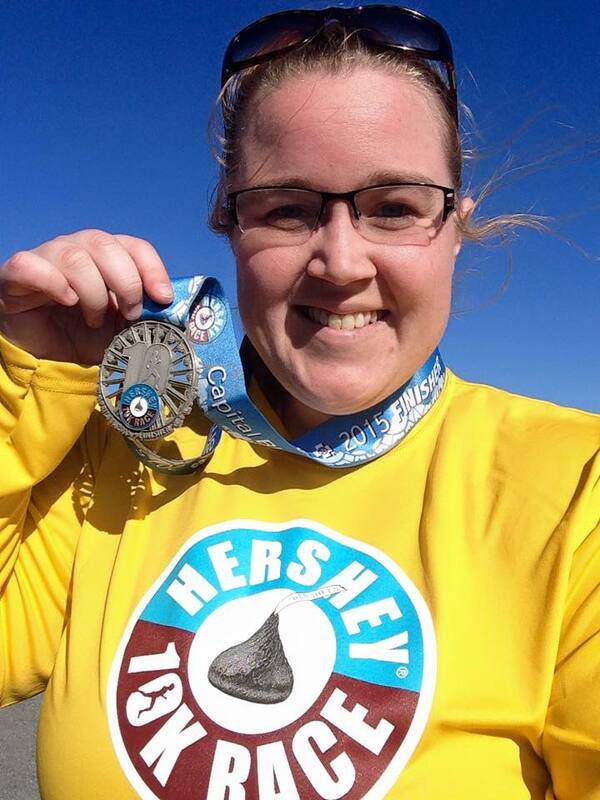 I decided then to set a goal – I was going to run my first 13.1 training run on my 26th birthday (September 14th) – I had 5 months of hard work ahead of me. 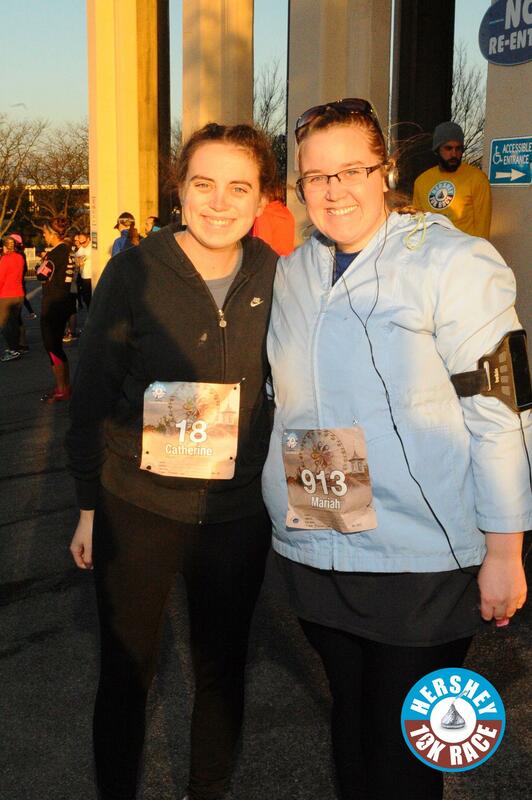 My mom began walking with me – my little sister encouraged me to keep going – my Disney sisters and I checked in on each other’s progress, but best of all, I downloaded RunKeeper and set it to post to my social media as a way to keep myself accountable. I wanted needed my friends and family to keep me on track, if I didn’t train for a few days, there was someone there to remind me I was slacking, or to encourage me when I felt I’d hit a wall, or experienced runner friends to offer tips and tricks that may help. All of that hard work was put to the test the morning of my birthday – a Sunday. I had never been more nervous for a run, but the weather was the perfect temp, the sky was clear and not one dog barked or chased me during my run. And guess what, I DID IT! I went farther than I needed to in under the time I was aiming for. I was OVER THE MOON. I had done it. I finished. I survived. I exceeded my own expectations and I loved how comfortable I felt in my own skin for the first time in a very long time. I was proud of what my body had just accomplished. Yesterday, I had planned to do another 13.1 training run. It didn’t go according to plan. For one thing, I think we’ve seen the last of our warm days, and the cooler air set in quickly. When I left for my run, it was a balmy 38 degrees Fahrenheit. I was comfortably dressed in a running tank top, over shirt, wind jacket, Under Armor pants and a running skirt. 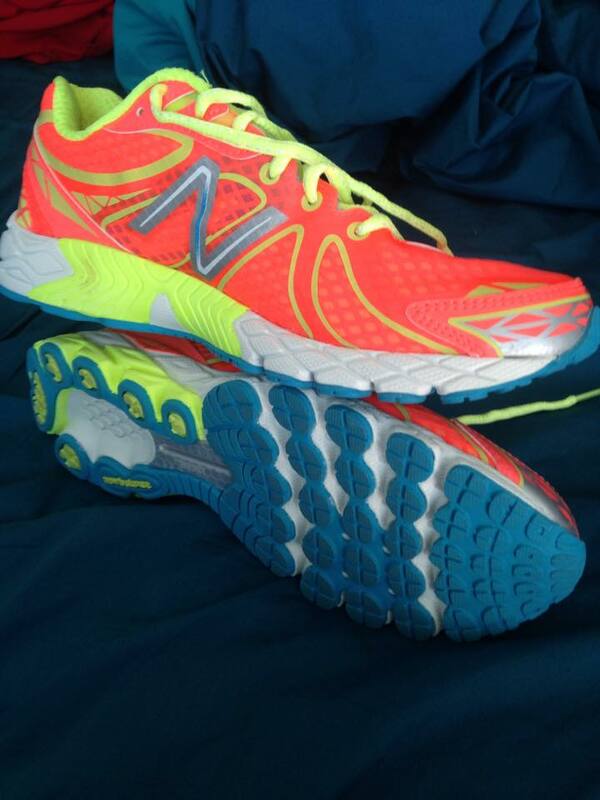 I was even rocking my brand new running shoes – they were a birthday gift from my parents! The cooler temps and the strong wind took its toll on my lungs and my knee. I couldn’t finish all 13 miles, I had to stop at 11. I felt defeated. my lungs were on fire, my knee wanted to buckle under me (I’ve had four knee surgeries, any slight change in air pressure causes pain.) and I had some nice blisters forming on my feet. I returned home after 2 hours and 45 minutes. While I am glad I listened to my body when it demanded I stop (there’s no way I’m risking an injury this close to the race), I started to panic that I wouldn’t be able to finish – enter my FANTASTIC support system. Someone pointed out I STILL have a month, and that’s I’m miles ahead of many people who will show up in November, another friend pointed out that my pacing was right on track from my birthday training run – had I been able to keep going, I would have finished at roughly the same time, and a third friend pointed out the weather conditions will be just a little more favorable for racing (warm air for my crumby lungs!!) and last but not least, I was reminded of how far I’ve come in such a short time, and that as long as I have fun, why worry! 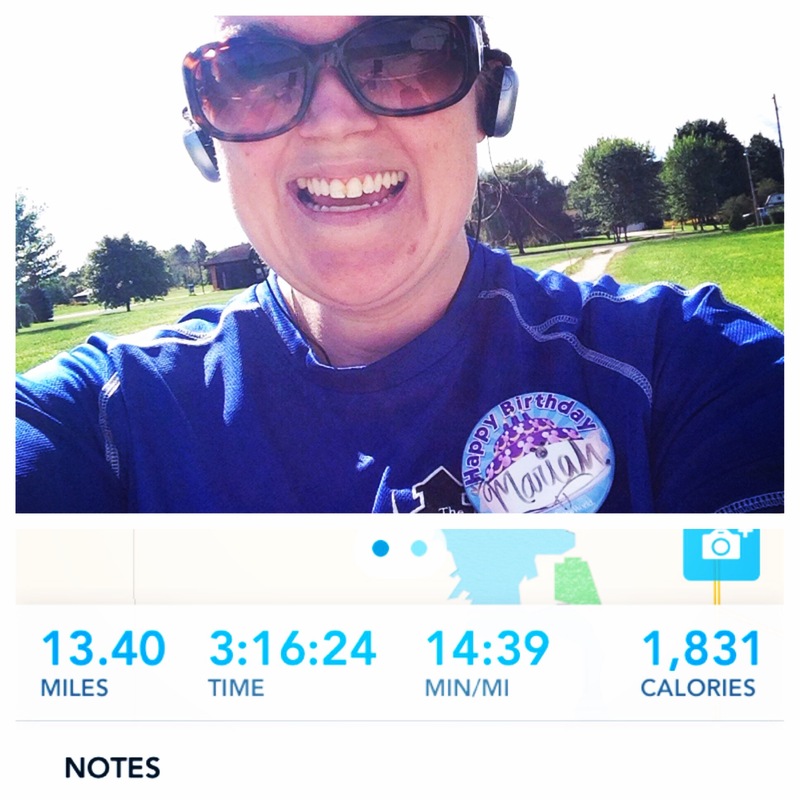 So I had one bad run, but really, it was a success – I went 11 miles. It was 47 degrees when I returned home. My muscles have relaxed and I’m not in pain. Still worried about those blisters, though. I am ready for Wine and Dine. I am ready to wear that medal with pride. I am ready to runDisney. Luckily, I was recently introduced to a great Disney running support group on Facebook and they were there to lift my spirits. Different members commented that they too had asthma and knew how challenging running could be. Look back at all the successes you have had in your training–I bet you have way more “wins” than “losses”! It’s all the work you have put in over the last few months that will get you across the finish line strong! Have fun at ToT–that’s a race on my bucket list for sure! And then there was the day I discovered I’d actually been running 8 miles when I thought I’d only been going 6! And on hilly, country roads! When the ToT race starts, trust your body to adjust your pace. Don’t worry about your time or pace. Enjoy the course and of course the after party. I feel so very blessed that these people I’ve never met before believe in me. I am as ready as I’ll ever be at this point. I WILL cross that finish line Saturday night and it won’t matter what place I’m in or the time on the board. All that matters to me right now is crossing the line and proving to myself, asthma and all, I’m able to tackle 10 miles with strength, determination and a little pixie dust! Will you be running at Walt Disney World this weekend?! Holy cow, I’m so excited right now I can hardly keep my hands on the keys so I can type. 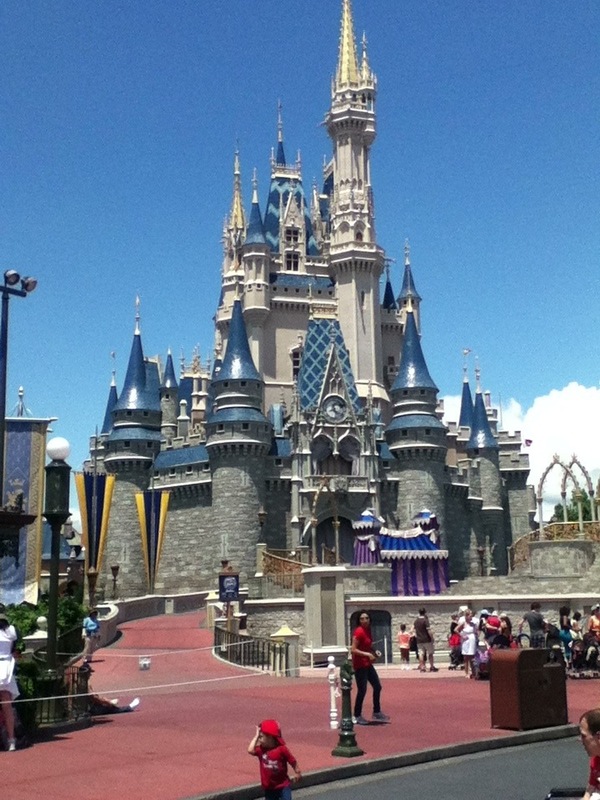 96 DAYS and counting until I am once again in Florida, or more specifically at WALT DISNEY WORLD!! Feeling like I’m where I belong. On days where running outside is out of the question, and because I don’t have a treadmill, please let me introduce you to my personal Walking Drill Sargent: Leslie Sansone. So anyways, I’m well on my way for training and vacation planning. My roomie and I (who’s running the race with me) have already started planning our costumes for the race and I know they will be great because she is uber crafty and creative. I promise to post pictures! And now I’m off to dream of genies, princesses, castles and kings…and who knows, maybe I’ll even practice outrunning a villain or two! Good night my fellow runDisney friends and readers! Since I’ve been training for the runDisney races, this is kind of the reaction I get when I tell people how far I will be running…without being chased, forced or punished! And to think, it’s even [GASP!] fun! Needed some time to myself today to think, relax and vent some pent-up frustrations, so I went for a nice little 4 mile run tonight around my neighborhood….no sidewalks, country roads and a couple of big hills. I can tell I haven’t run that course in a few weeks because my legs were killing me and my lungs felt like they were on fire, but I didn’t care because for the 50 minutes I was out there nothing could touch me. All I could focus on was left foot, right foot, inhale, exhale, left foot, right foot, inhale, exhale. My subconscious had a mind of her own as she listened religiously to the songs on my running playlist. At one point she wanted to breakdown and cry because she was feeling sorry for herself and all the things that haven’t “gone according to plan” in her life, but she quickly found out it is painful to try and have a total crying and emotional meltdown mid-run. I am proud to say that together we finished our run with heads held high and tears (mostly) unshed…also doesn’t hurt having all those endorphins flying around! 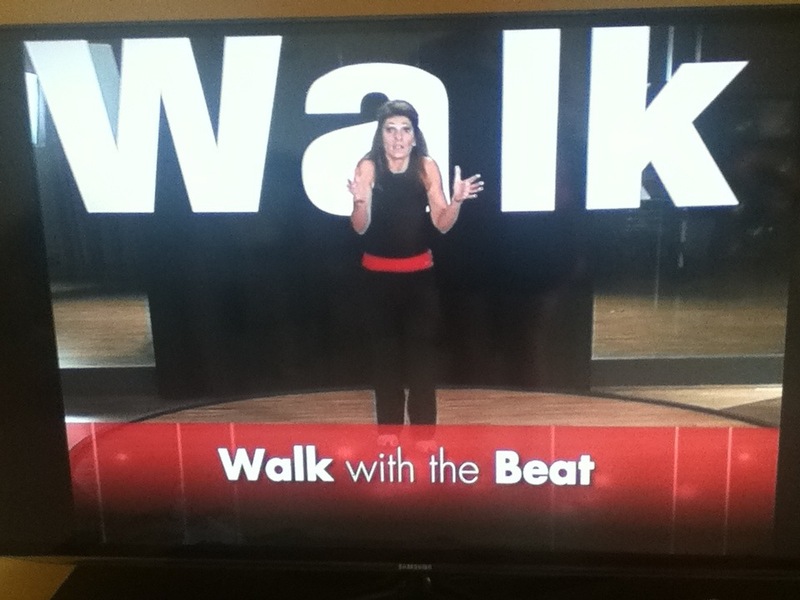 My training is a work in progress still, I’ve been doing a couple Leslie Sansone Walk At Home workout DVDs with my mom, too. Earlier in the week we did one that had a 30 minute abdominal workout after a 2 mile walk, and my abs were hurting 2 days later! I’m asking you to help keep me accountable to my exercise and healthy eating plans. I’m back to counting my calories and keeping a daily log of what I eat. I’ve decided to make some small changes to my eating pattern, for example, limiting the amount of 2% milk I drink to 1 cup a day (1/2 cup on my cereal in the morning, the other 1/2 with lunch). I’m also trying to drink more water everyday, I have a personal goal of 10 cups of water every day…that’s only 5 16.9 oz water bottles. I am proud to say I hit that goal everyday this week at work, and the girls I work with noticed, too. My thinking is that by drinking more water I can curb my appetite between meals and lesson my chances of snacking. So that’s how I’m training and trying to get healthy this summer. My next race (10 miles) is the first weekend in October, so I’m hoping to be at my healthiest by then. Do you have any training tips? What healthy food is your favorite? I need all the encouragement and support I can get so I don’t fall off this bandwagon! I have been training for today for months now…. I have gotten countless blisters, come close to multiple asthma attacks running in the cold, and thought I was going to die as I pushed myself harder and farther than I would have dreamed possible a few years ago. But once I set my mind to something, I give it my all. 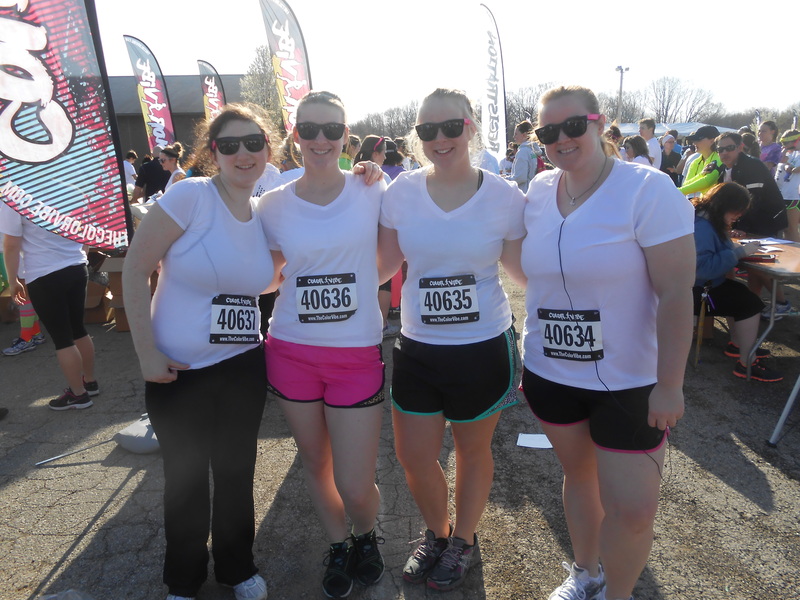 Today was the Color Vibe 5K — my sisters, my best friend and I made up Team COLOR WARRIORS! And colorful we ended up being….but I’m getting ahead of myself! The race was supposed to start at 9:00 AM, and we left the house in plenty of time! However, traffic was a NIGHTMARE! This was the first Color Vibe event held in this area and the event staff only hired 3 police offices to handle parking according to tonight’s evening news. They claim they didn’t know it would be so popular (9,000 participants, not including all the people coming to support and cheer on the runners). We ended up sitting in a long line of traffic for 20 minutes, not moving very far or fast, we never even made it back to where they were parking for the race. We parked somewhere else (along with other races who were clearly sick of wasting gas in the crazy ridiculous line) and walked back to the entrance. I don’t know if this is how every Color Vibe works, but ours had heats leaving the corral every five minutes. We ended up in heat #4. When we picked up our race packets they came with color packets, but we all decided to save ours until the end of the race and go crazy with them. Well, one of the volunteers thought that wasn’t a good idea, so he came over to us and said “Too clean ladies” and sprayed us with yellow dust from what looked like a fire extinguisher, let me tell you, that kind of hurt! I had two goals going into today’s race: 1. Don’t go into an asthma attack from all the color “dust” and 2. Get a PR (personal record) — time to beat 41:52 from when I participated in runDisney’s Princess 5K in 2011. The race course was at a local fairgrounds. The terrain was a bit challenging at points, we started running on loose gravel, then pavement, then grass, then dirt and everything else in between. There were a couple of times I was worried I was going to twist my ankle because when I set my foot down the rocks under my shoe shifted throwing me somewhat off-balance. Then there were the hills and hairpin turns in the course — you really had no idea what you were going to come to next. The color stations were AWESOME! The volunteers were amazing, yelling encouragement and cheering us on! But as great as they were, they had nothing on our own cheering section! Our parents, our Aunt Khris and our cousin Mandy (who is ready to have her first child ANY DAY NOW) all came to cheer us on! They were there to take pictures at the starting line and to celebrate with us when we finished! It was so great seeing them as we ran past, knowing they supported us and believed in us! It meant so much! I LOVE the support of my family! They are wonderful and without them I’d be lost! I am proud to say, I accomplished both of my goals! Finishing time — 30 minutes even!! I took 12 minutes off my time! While on the course, I thought I was going to die and that I was going so slow. I had to walk a few times since I accidentally breathed in some of the dust and it KILLED my lungs and pace. I was very grateful one of my little sisters, Megan, stayed with me. She kept me focused and motivated and pushed me to keep going. I did feel bad because I knew I was slowing her down, but I was very glad she was there. My other little sister finished with a time of 28 minutes — you ROCK, Macayla! My best friend finished with a time of 36 minutes! When we all finished, we went to town with the color packets. I don’t think there was any white left, which was the point! We are already planning crazy costumes for next year! But….before that, I’ve got another 5K to run next Saturday at Walt Disney World, so stay tuned dear readers, more running excitement to come! In the meantime, enjoy some crazy photos from our colorful running adventures today! 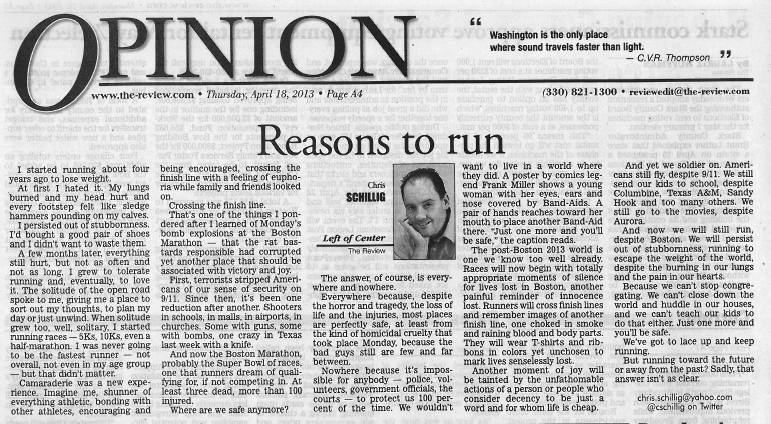 I knew it was about the tragic events at the Boston Marathon and I wanted to know what he had to say.